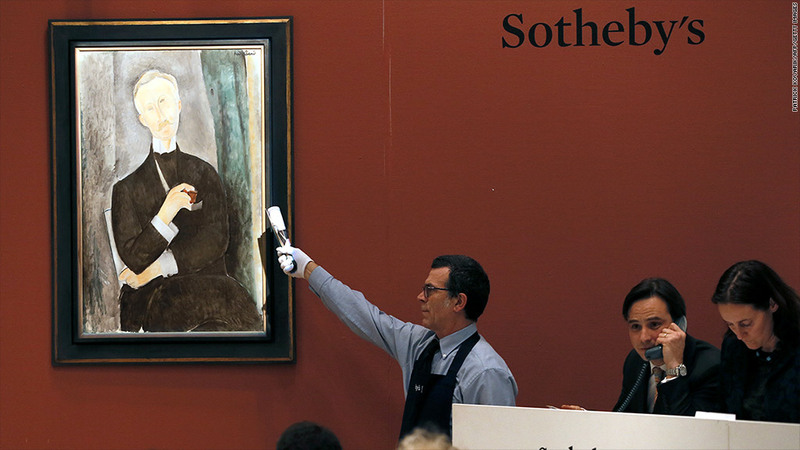 eBay is partnering with Sotheby's, shown here auctioning a painting by Amedeo Modigliani last year in Paris, to stream its art auctions live online. eBay has partnered with Sotheby's to live stream auctions on its web site, the companies announced Monday. eBay (EBAY) and Sotheby's (BID) said that they want to capitalize on the growing use of online mobile devices, noting that online art sales are projected to increase to $13 billion by 2020. "eBay in the near future will be launching a newly-designed experience on its site, tailored for collectors of rare, unique and premium art and collectibles as well as first time buyers," the companies said in a joint press release. The venture will start by streaming live auctions from Sotheby's New York headquarters, allowing "real-time bidding from anywhere around the world." Sotheby's chief operating officer Bruno Vinciguerra said the new venture will "make our sales more accessible to the broadest possible audience around the world." Sotheby's spokesman Andrew Gully told CNNMoney that there is no firm date for the launch of the live streaming, but it will be late this year or early next year.